I think by now we all know that I’m not exactly a culinary genius, right? Up until about two years ago, the closest to “homemade” I got was mixing two boxes of something and calling it an “invention.” Well, the other night, AllWhites Egg Whites made even a novice like me feel like a real master in the kitchen! 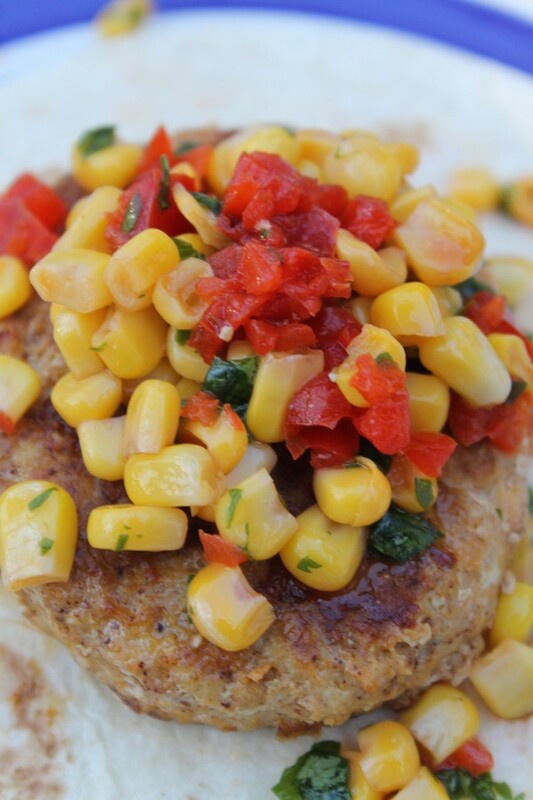 I am SO proud of these Grilled Mini Turkey Taco Patties and the colorful corn relish topping. I couldn’t have done it without AllWhites Egg Whites. Seriously, I couldn’t, it’s their recipe. Before we get to the yummy goodness that is the Grilled Mini Turkey Taco Patty, let’s talk AllWhite Egg Whites, shall we? I’ve NEVER made a burger before. In my life. I don’t eat red meat. Only chicken and turkey. But I had no idea how to actually make the patty. I thought you just kind of mushed the meat together and called it a day. Well, that’s not exactly how it goes. Those of you who actually know how to cook are probably shaking your heads in dismay. You need something to hold it all together. Egg whites are perfect for that. Now, if I couldn’t figure out how to make a patty before, do you really think I know how to separate eggs? Enter AllWhites Egg Whites! 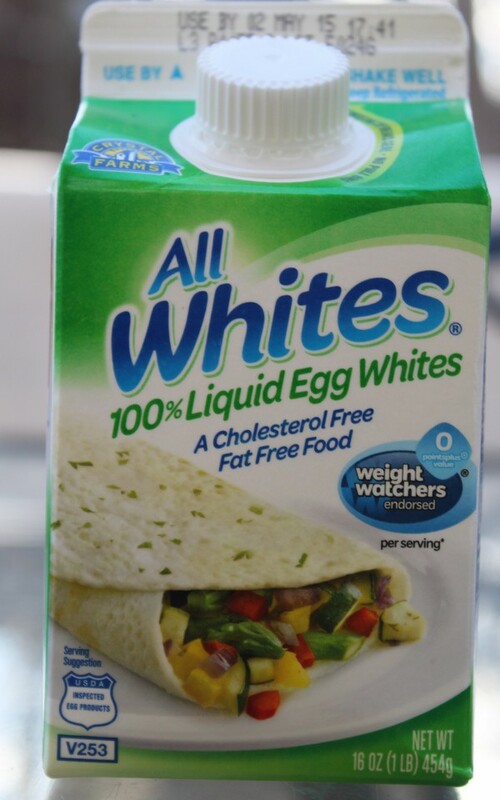 AllWhites 100% Liquid Egg Whites are exactly what they sound like: liquid egg whites. 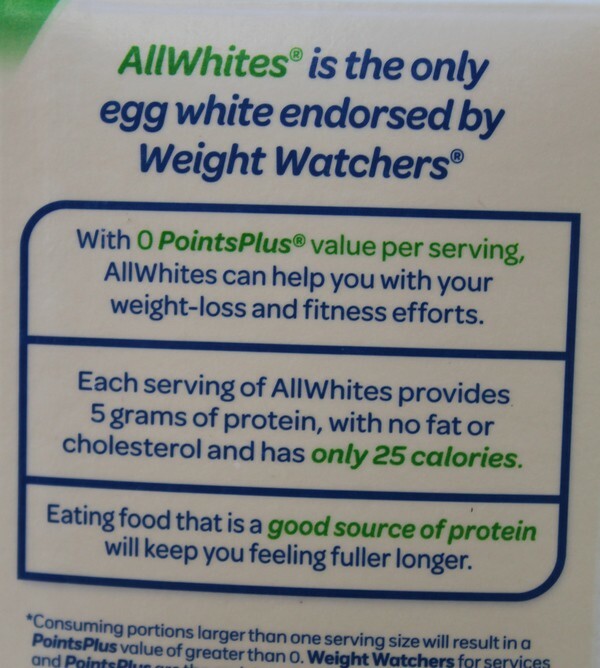 They also happen to be the ONLY egg white endorsed by Weight Watchers. Why? Well, a single serving contains no cholesterol, no fat and 0 PointsPlus® value on the Weight Watchers® program. AllWhites is also a good source of protein, with 5 grams per serving. Getting enough protein is a challenge for me. I’m such a picky eater that it’s hard to find combinations of foods that I enjoy. I find that if I don’t get enough protein for dinner, I hit a major 7pm slump. I’ve actually fallen asleep on the couch many times! Protein is also important in the spring and summer, when it’s actually warm enough to get outdoors again. Now let’s see that recipe! You can find the original, along with many other yummy ideas, at AllWhites Egg Whites Favorites. Fire up your grill to medium heat or take out a large skillet if you’re using the stove. Combine your turkey, AllWhites egg whites, chili powder, crushed chips, salt and pepper in a medium mixing bowl. Squish it until it’s all mixed. Shape into 4 oblong patties and stick in the fridge until you’re ready to cook it. Mix the lime juice, sugar and oil in a medium bowl. Stir in the corn, red pepper, onion and cilantro until well mixed. Grab the patties out of the fridge and put them on the grill (or your skillet, sprayed with cooking spray if needed). Cook about 8-10 minutes, turning once. They’re done when the center is no longer pink. 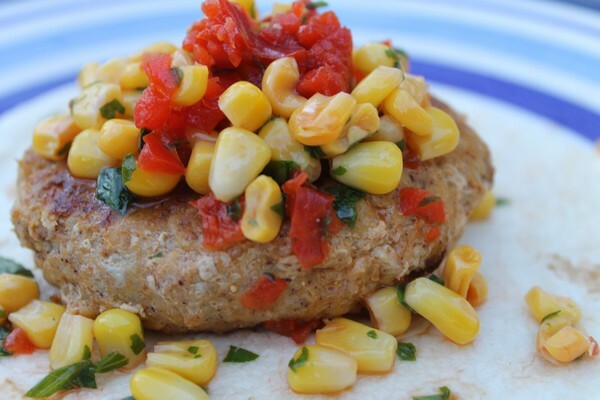 Serve the patties wrapped in warm whole-wheat tortillas, add a spoonful of the corn relish on top. I added the relish on the patties, then wrapped it. It just made for better pictures. Plus it was less messy. AllWhites Egg Whites made it so easy to create the turkey patties, and the tortilla chips added an interesting dimension to the taste. The whole combination was absolutely amazing. Next time you see a recipe that calls for eggs, reach for AllWhites Egg Whites instead. You can use them as a healthy alternative for just about any recipe. I can’t wait to try it in more recipes! In fact, I’m checking out more inspiration at AllWhites Egg Whites on Pinterest . Check out AllWhites Egg Whites on Facebook to keep up with news! Ready to try AllWhites Egg Whites in your own recipes? Enter for a chance to win a MONTH’S worth of AllWhites Egg Whites coupons! I’m going to make this one REALLY easy for you! Just comment below with the answer to the question: what recipe would you make with your AllWhites eggs? That’s it! Oh, and be sure to leave me a way to contact you. If you leave your email in the comment form, you don’t have to put it in the comment itself, I can see it (that way it’s kept private between us). Ends 4/16. What is your favorite recipe to make with AllWhites Egg Whites? Share in the comments! I just looked through the recipes they have featured on their website, and the good-for-you triple chocolate brownies would be high on my list of things to make. They sound pretty awesome too! Of course, I’m in for anything with chocolate in it! Oh, that looks delicious! I was wondering if there was a product out there of just egg whites. We love macaroons over here, and I have a few grain-free bread recipes that call for whipped egg whites to add “fluff” to the otherwise dense loaf. I definitely would use these egg whites for something along those lines — because otherwise I end up with a LOT of sad egg yolks that need to be made into ice cream ;). Pinning this to my food board! (Ohh, salisbury steak might be yummy too). I love the idea of egg whites pre done I know they healthier but separating them at home seems wasteful and time consuming. I love find new ways to make breakfast healthier. Great recipe thank you! Thank you for sharing your yummy recipe and telling us about AllWhites 100% Liquid Egg Whites. I have seen this in the grocery store and have wondered if I should try it. Now I really will. I could see myself using this for my Egg Fritata or trying to put together a Turkey meatloaf. I will also try your Turkey Burger because it looks so delish! Wow, this recipe looks delicious. We eat a lot of chicken and turkey in our house and I am always trying to think of creative ways to prepare it. 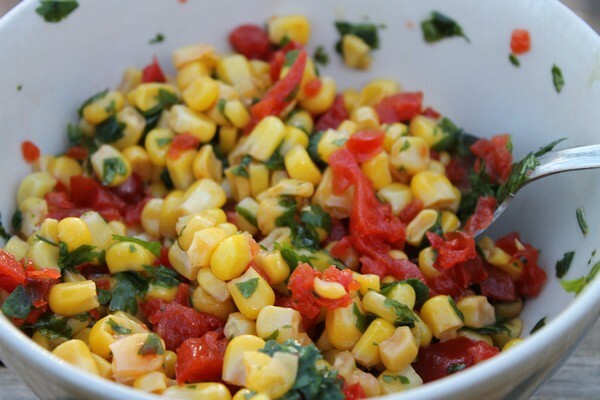 This salsa has me dreaming of summer and grilling in the backyard…it looks like it would be great on fish, too! Did I miss dinner?!? I’ve been wanting to try turkey in place of hamburger meat, but that only thing I’ve substituted it in was chili. I love the looks of this recipe with corn in it! I’m adding it to my menu this week. It is SO easy and delicious! I hope you enjoy it as much as I did! Oh wow. That looks so delicious! It has a lot of protein too, which I like. I don’t really make patty myself. I usually just buy it at the store. Now after I know how easy it is to make patty, I will try to make it myself. The corn relish also looks so good. Thank you for sharing the recipe with us! Trust me, if I can make it, ANYONE can, lol. I am not the best cook in the world, so I’m ALL about the easy! Can you believe that I never eat turkey apart from Christmas Day? There’s just something so alien to me about having turkey mince or a turkey burger. Your turkey patties with the salad look delicious though and now I’d love to give one a try, it might make a nice change from my usual chicken dishes. Thanks so much for sharing and making me want to try something new. We’ve never ever tried adding egg whites to our turkey burgers, but now we will! We love making turkey burgers but they never stick together, now I think you’ve finally shown me the remedy! Thanks a bunch for sharing your secret and this delicious recipe, I’ll be giving it a try soon! These look great and perfect for any family dinner! The colors are great and very inviting. I love the use of egg whites. Its a great way to make it stick together! Will be sharing this recipe with my mother in law, she loves turkey patties! Thank you so much for the compliments on the colors! This is the first recipe I ever made where I actually liked the pictures too. I’ve made things that tasted good but weren’t pretty, so that’s a huge compliment for me! I would make Vegetable & Grain Quiche. Looks very healthy indeed! Thanks for sharing it with the Say G’day party! Pinned and hope to see you on Saturday! Hmm very interesting recipe, the photos make it looks so good!!!! I may have to try this! Thank you for some an easy dinner that everyone will like. After work can be crazy and this will make dinner a breeze. Oh, this looks wonderful! We have ground turkey patties, but these look even better! Thanks for the recipe! This looks delicious and easy to make. Thank you for sharing.